Mon., April 4, 2016, 9:27 a.m. 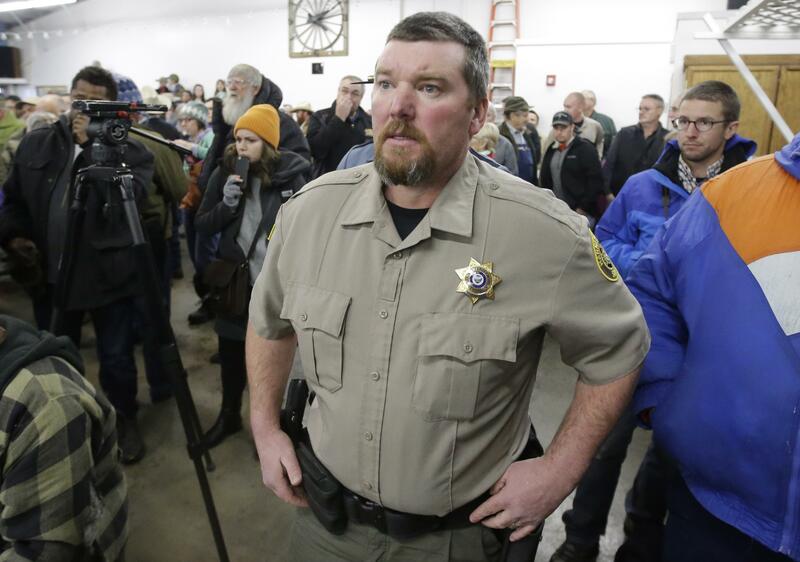 The actions of two rural Oregon sheriffs during an armed standoff at a national wildlife refuge were striking: one worked with federal officials to end the siege while the other questioned the FBI’s authority and offered words of support for the occupiers. Sheriff Dave Ward of Harney County, where the Malheur National Wildlife Refuge is located, cooperated with federal and state police, urging standoff leader Ammon Bundy and his followers to stand down and respect the law. Meanwhile in Grant County, immediately to the north, Sheriff Glenn Palmer called the occupiers “patriots.” When Bundy and others were arrested during a Jan. 26 traffic stop, they were on their way to his county. An Arizona rancher who police fatally shot when they say he reached for a gun shouted he was on his way to meet Palmer. Palmer is a member of the Constitutional Sheriffs and Peace Officers Association, a group that bills itself as “the last line of defense” against a federal government they contend overreaches on gun control and other issues. They see sheriffs as the ultimate law enforcement authority in their dispute with the federal government over control of federal lands. Richard Mack, a former Arizona sheriff and founder of the Constitutional Sheriffs association, said he didn’t support the occupation of the wildlife refuge, “but I understand the complete frustration people have in this country towards this government.” Mack said the group will work to defeat Ward in the November election. Mack’s group, founded in 2011, claims more than 400 of the nation’s more than 3,000 county sheriffs support its positions, which hold that elected county sheriffs should oppose federal agents whose conduct appears to violate the U.S. Constitution. Spokane County Sheriff Ozzie Knezovich believes the group’s membership numbers are exaggerated. He said the organization is primarily focused on promoting Mack. Knezovich disagrees strongly with the association’s philosophies. The Constitutional Sheriffs group is unequivocal about gun rights. It supports the right of criminals and the mentally ill to carry firearms and opposes gun registration or background checks. In conservative Kootenai County, popular Sheriff Ben Wolfinger has drawn two opponents who support the concept of constitutional sheriffs. Tina Kunishige, one of the candidates, said sheriffs need to decide which laws are constitutional. Wolfinger said he doesn’t need an outside group like the Constitutional Sheriffs and Peace Officers Association to approve how he does his job. “I believe that the people I serve in Kootenai County will hold me accountable to do the job that they elected me for,” Wolfinger said. Sheriffs who support the association have faced backlash. Palmer, the sheriff who sided with the Oregon occupiers, has drawn an opponent in the November elections who criticized him for making his own interpretations of the Constitution. He did not respond to interview requests from the Associated Press and is being investigated by the state for his actions during the Oregon standoff. If Palmer is found to have violated standards, he could lose his police certification. The Oregon occupation started Jan. 2 and ended Feb. 11, when the last holdouts surrendered to authorities. It began as a protest amid mounting tension over the case of local ranchers Dwight and Steven Hammond. The Hammonds lit fires on federal land in 2001 and 2006 to protect their property from wildfires and invasive plants. The two were convicted of arson three years ago and served time – the father three months, the son one year. But an appeals court ruled the sentences were too short under federal law, and a federal judge ordered them back to prison for about four years each. Mack backs Palmer in the ongoing investigation into his actions. “He’s an honorable man who has done nothing wrong,” Mack said. Published: April 4, 2016, 9:27 a.m.